Blogging traditionally is a “fast” activity. People demand constant and fresh, regular, relevant updates and bloggers often rush to be the first to break or comment on some news or event. Now, I am not saying that (ironically) I am a bit slow, here, but notice that Slow Blogging was first mentioned in 2006 and the news stories I have highlighted were from last year! So, taking Tod’s lead, I am working on my Slow Blog Manifesto and will post it up here when it is done. Any thoughts on what is should include? 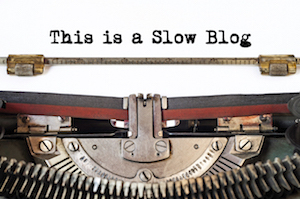 What is an “ideal” slow blog and slow blog entry?